Often called 'Climbing', it is actually just tall, so grows up a post or cane. Grow in big pots and feed well. Will reach 60-70cm in year 1, and flower all Summer - then protect from cold next Winter. Supplied as 9 jumbo plug plants - 3 each orange, violet and salmon. Grow on in small pots for 4-5 weeks til frosts pass. 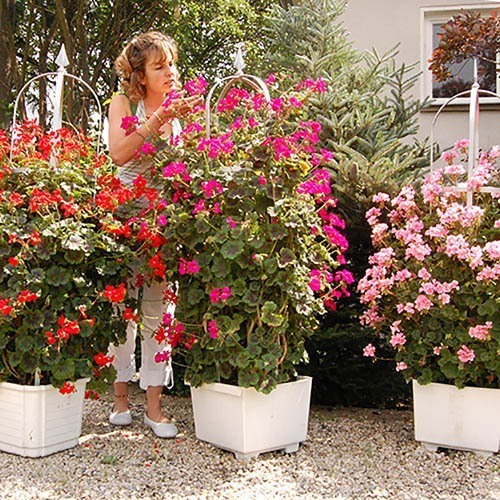 Antik Geraniums are unique because they grow taller than any other variety in existence! They are so vigorous they are often referred to as The Climbing Geranium, reaching around 1.2m (4ft) tall in a single season. Plant them 3 of one colour in a 25-30cm diameter pot and watch them grow! They can be over-Wintered in a frost free conservatory, porch or garage too, and will reach 1.5M or so in subsequent years. ery unusual and often not found in garden centres because they do not suit the small pots they so often sell, as they out-grow them quickly. The will look great as part of your patio displays as they will add ultimate height, but planted amidst a bed or border display they will make a really unique focal point. Supplied as 9 Jumbo Plug Plants (2.5 - 3.5cm diameter) 3 each of 3 varieties. Not frost hardy so keep protected until the last frost. Flowers from May until first frosts in the autumn. Height approx.. 1.2m (4ft).